Shaker-style cabinets are painted in Benjamin Moore’s White Dove. Crisscross mullions on the upper glass fronts lend a “coastal/nautical feel,” says kitchen consultant Jan Swider of Cornerstone Home Remodeling Center in Bridgewater. Tucked into the island is a beverage cooler and microwave. Behind the door is a storage-packed walk-in pantry. 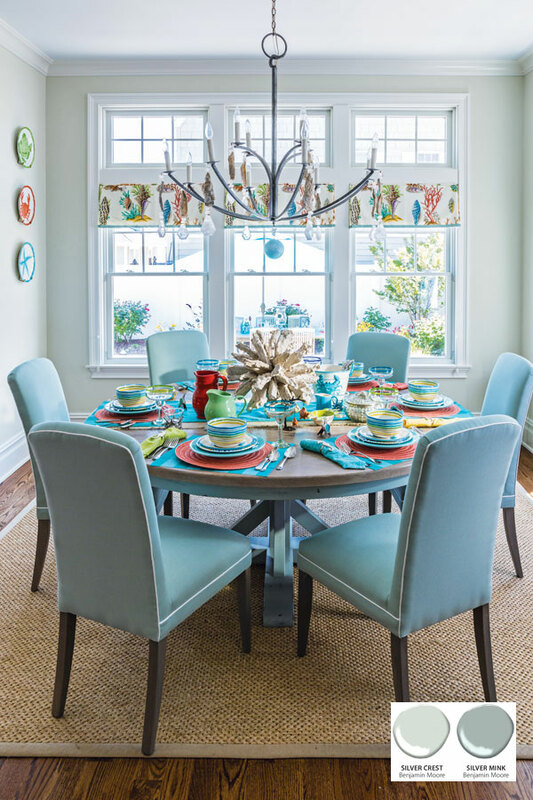 Walls—painted a soft bluish-green (Silver Crest by Benjamin Moore)—serve as a quiet backdrop for colorful tableware and coastal-inspired design elements. Made of reclaimed Pennsylvania barnwood, the dining table has a driftwood finish on top; the base is painted Silver Mink, a shade three times darker than the walls. Aqua-toned chairs are upholstered in an easy-to-wipe-clean indoor/outdoor fabric. In the living area, furnishings contain a mix of weathered wood finishes and stain- and sun-resistant upholstery fabrics. “We wanted guests to walk into the house and feel like they could just unwind, relax and put their feet up on the furniture” without any worries, Karas says. “My husband likes to cook and I like to entertain so the kitchen design really works for us,” says homeowner and interior designer Sherry Karas, seated at the 8-by-6-foot kitchen island. After sampling several countertop materials, the Karases chose polished granite for the laid-back beach house because it held up best to a 24-hour red wine, tomato sauce and lemon juice experiment. Ten-foot ceilings with ample windows and transoms were among the design priorities for the first floor’s wide-open layout. 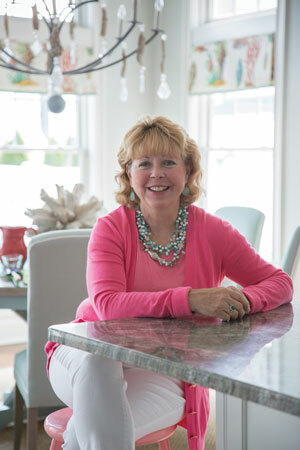 In a beach house, “I do prefer a less-is-more approach so you have access to lots of natural light,” says Sherry Karas, who chose minimal but elegant window valances in seashell and coral motifs. Lime and orange accents energize a television/sitting room off the foyer, furnished with a queen sofa sleeper. Woven window shades keep things simple. Pale blue/greens and shades of white radiate calm in a light-filled master bedroom. 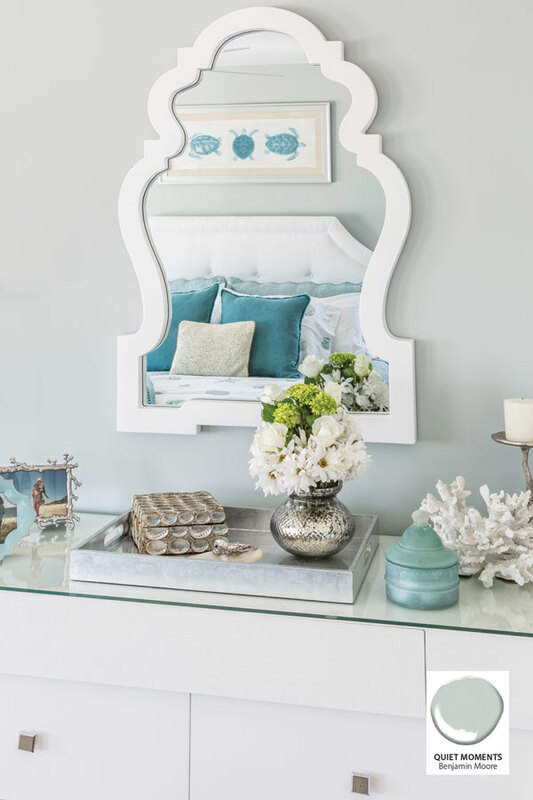 High-ticket items, such as the upholstered headboard and silver oyster-shell chandelier, stylishly coexist with mostly bargain-friendly accents. Window treatments, for example, “were made using five very inexpensive shower curtains from Home Goods,” says Karas, who accented them with custom trim. The chic, grass-cloth-covered dresser and mirror and the white Chippendale chairs—are quality thrift-store finds. “I’m a big shopper at Housing Works in New York City,” Karas says. Bunks and pullout trundles maximize sleeping quarters in two guest bedrooms (one shown). “You can never have too much sleeping space at a beach house,” Karas says. 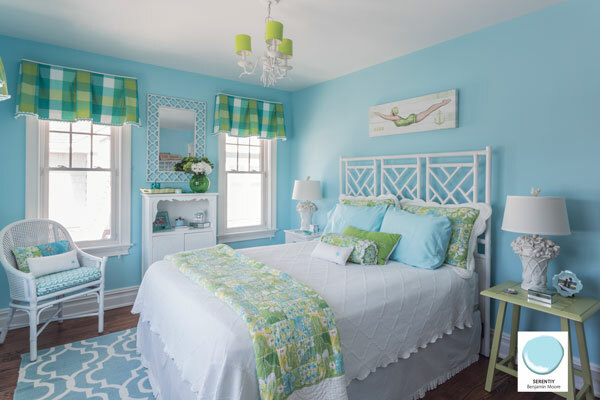 A vintage Lilly Pulitzer fabric—used on the window cornice—inspired the room’s punchy palette. A decorative handmade and glazed fish pattern —used in small doses— elevates the look of basic 4-by-4-inch white ceramic field tiles in a hallway bathroom. Similarly, “a small investment in hardware,” such as the whimsical turtle-theme knobs, “can turn a classic white cabinet into something interesting and special,” Karas says. 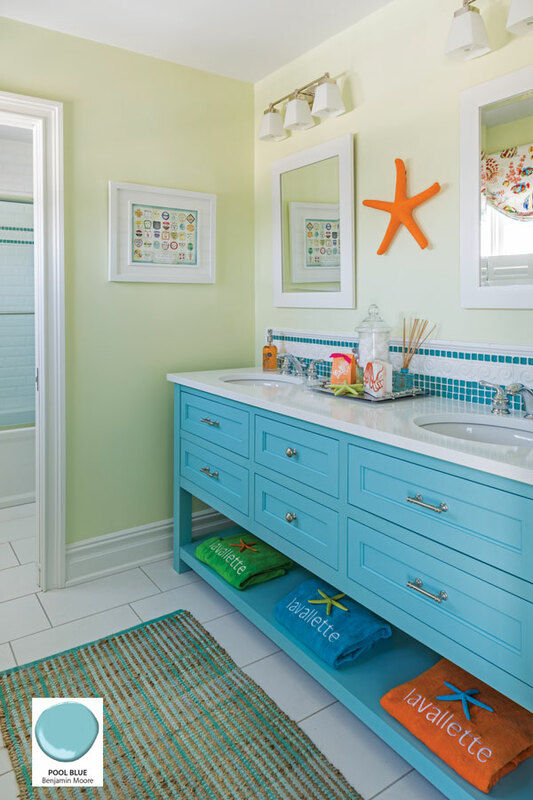 To make waves in a guest bathroom, Karas had the cabinetmaker paint the custom vanity in Pool Blue. 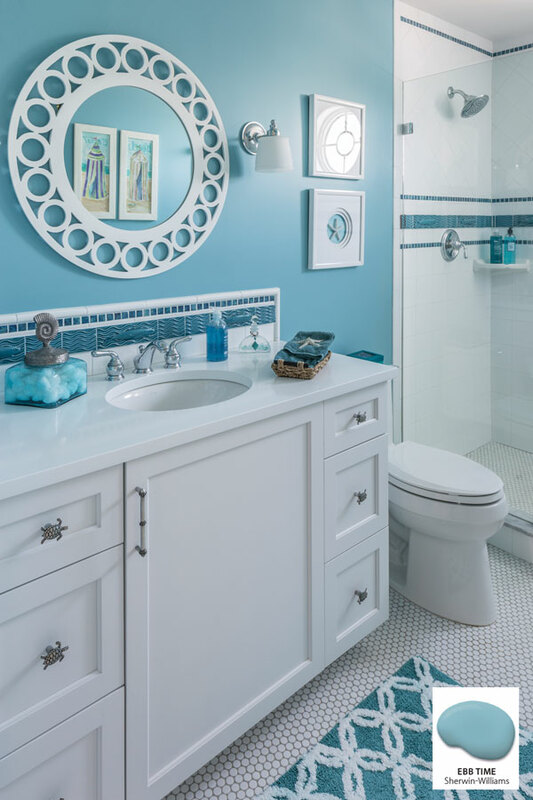 When it arrived, “My builder referred to it as the Smurf vanity,” Karas says jokingly, but “I loved it from the moment I saw it.” For a finished look, she repeated the aqua glass mosaic detail above the vanity in the shower. A vintage child-size sailor top—most likely a school uniform in its day—is charmingly displayed in a white modern frame with grass-cloth backing in an upstairs hallway. 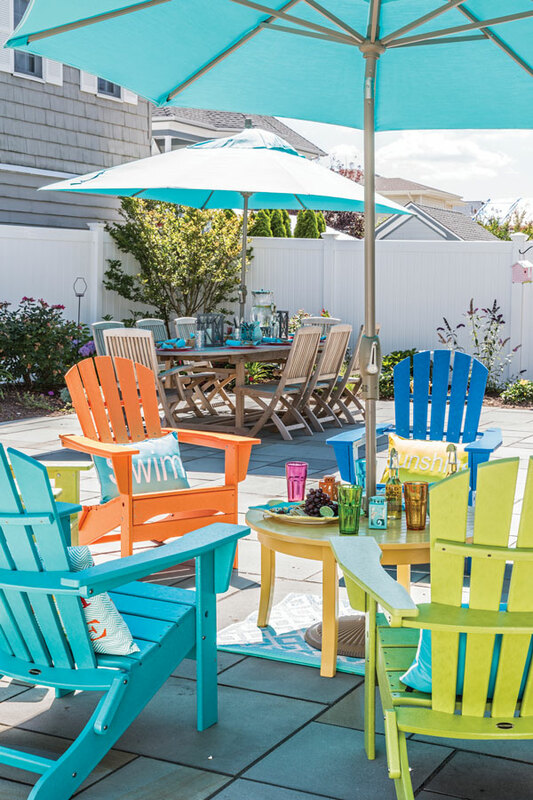 A colorful mix of Adirondack chairs and a teak dining set ensures there’s always a spot for one more guest on the bluestone patio. A fully intact horseshoe crab shell— found on Kiawah Island, South Carolina, and preserved by the homeowner—now greets visitors in the foyer. 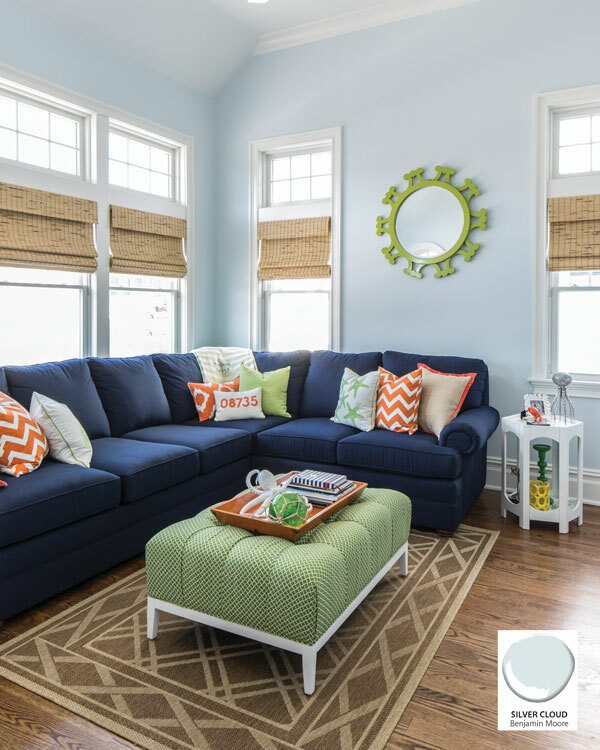 Sea-glass hues, subtle maritime touches and easygoing finishes inspire a beach-friendly home at the Jersey shore. 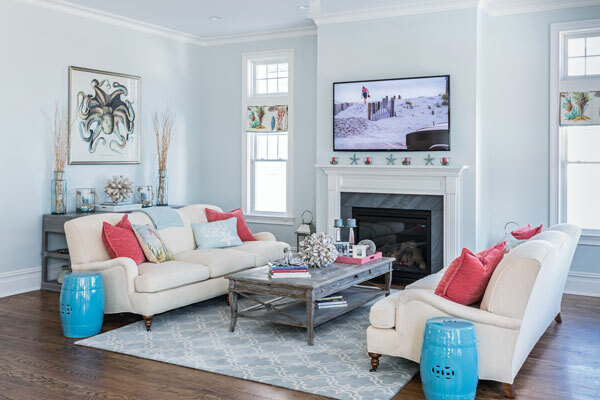 The adage “if you build it they will come” rings true for Sherry and Joe Karas, who built a house for family and entertaining in a town they love: Lavallette in Ocean County, New Jersey. “It’s a little haven, and we feel lucky to be a part of it,” Sherry Karas says of the family-friendly community that offers easy access to the ocean and bay, restaurants and shops within walking distance, and friends with homes nearby. The couple purchased the property in 2007—a teardown—with plans to rebuild as they gathered ideas and put their two children through college. 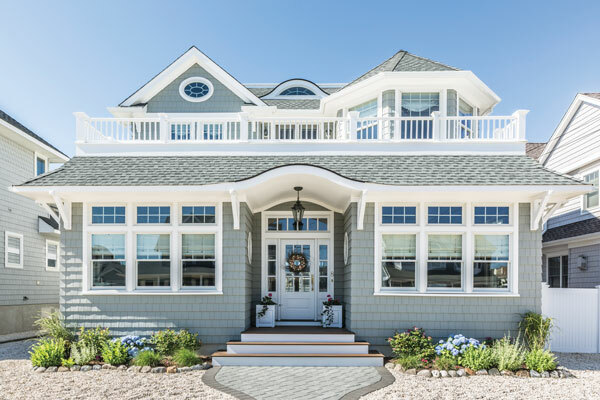 Six-summer seasons later architect Michael Melillo, a member of the American Institute of Architects and principal of Melillo Architecture in Brielle, NJ, whose work they were “immediately drawn to” on the coast, drew up blueprints for a classic seaside home with a shingled façade. “We really wanted a traditional coastal home that you would find in Nantucket or the Hamptons,” says Karas, an interior designer and owner of Whitney Interiors in Bernardsville. Completed in November 2013, the 3,300-square-foot home with five bedrooms, 3½ baths and the requisite outdoor shower is “a perfect fit with our lifestyle,” Karas says. “We use the house continuously from May through most of September and then several times throughout the rest of the year.” On summer weekends, when their son and daughter arrive from New York City with their own friends in tow, “We can have up to 12 or more young adult guests,” she adds. Well-suited to a crowd, the open layout features a spacious kitchen designed with help from kitchen designer Jan Swider of Cornerstone Home Remodeling Center in Bridgewater. The light-filled setting—with ample windows and transoms throughout—overlooks a casual dining area and living room, the primary gathering spots. “Sherry was such a fun client to work with,” Swider says. “She came armed with a lot of her own ideas and just needed some help pulling it together.” The pair discussed “getting just the right shade of white” for the Shaker-style cabinets, which are painted in Benjamin Moore’s White Dove. Ten-foot ceilings allowed for tall, stacked cabinets with crisscross mullions for a coastal, nautical nod, she adds. “Guests and family love to hang around the 8-by-6-foot kitchen island,” Karas says. It’s topped with polished granite in colors that remind her of the “greens and gray in the ocean off the coast of New Jersey.” After sampling several materials, she and Joe agreed that granite was the way to go because it held up best to a 24-hour red wine, tomato sauce and lemon juice experiment. For the wood stools it was a toss- up. 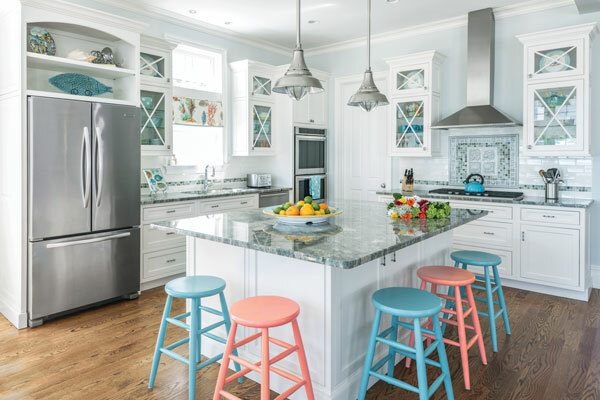 “I couldn’t decide between coral or turquoise,” so she followed her spouse’s suggestion and painted them in alternating colors. “It’s a little more fun that way,” she says. The television is visible from every vantage point within the open setting, Karas says, “so no matter what you are doing in that area you feel part of the group, which was our intention.” There’s also a separate television/sitting room off the foyer so the family can entertain different groups of guests simultaneously. Furnishings with clean modern lines and weathered wood finishes reflect a comfy, casual but sophisticated beachy vibe. “We wanted all guests to walk into the house and feel like they could just unwind, relax and put their feet up on the furniture” without any worries, Karas says. Consequently, all sofas are deeper than average with upgraded down/down combination cushions, and every upholstered piece (sofas, dining chairs, ottomans and benches) is custom done in indoor/outdoor fabrics. “It’s easy for cleaning, durable and helps prevent fading from the strong sun,” she adds. With a significant portion of the budget allotted for upholstery upgrades and other costly design elements, Karas took every opportunity to save money wherever she could. In the bathrooms, for example, she used basic white ceramic for field tile and then chose higher-end accent tiles in small doses for big impact. “This saved me significantly in material costs,” she explains. The self-proclaimed “dedicated Home Goods shopper” also scored many fun accents—tableware, bedding, lamps, pictures, rugs and more—from various store locations. She’s also a “big shopper at Housing Works in New York City,” where she picked up assorted upscale, budget-friendly pieces such as a fashionable grass-cloth dresser, mirror and Chippendale chairs used in the master bedroom. One thing you can always count on in the Karases’ home is that element of whimsy, interest or surprise. “I don’t want to be taken too seriously, especially at a beach house,” she says. That’s why, for example, you’ll find a fun assortment of cabinet hardware—sea turtles, kissing fish, crabs or mermaids—in many rooms. “A small invest­ment can turn a classic white cabinet [or readymade vanity] into something interesting and special,” she says. A morning walk along the beach at a longtime friend’s vacation home in Kiawah Island, South Carolina, produced probably the most unusual element in the home: a fully intact horseshoe crab shell that she placed in her friend’s car trunk (not to her delight) and FedExed back to New Jersey, where she cleaned and dried it and preserved it with two coats of high-gloss lacquer spray. 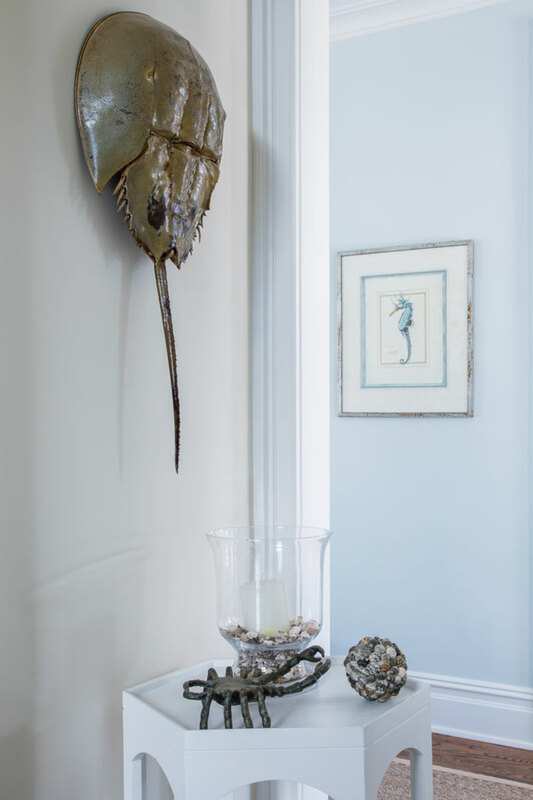 Says Karas, “I hung it right as you enter our house, and no one comes in without making a comment on the horseshoe crab…it’s one of my favorite features!” And oh, the story it tells. Overall: architect, Melillo Architecture in Brielle; builder, Kozlowski Construction LLC in Lavallette; interior designer, Sherry Karas of Whitney Interiors in Bernardsville. Exterior: siding, Cedar Impressions in Seagrass by CertainTeed; roof, Timberline® in Slate by GAF Materials Corp.; landscaping and bluestone patio, Bay Head Landscaping & Nursery in Point Pleasant; lighting, Capitol Lighting in East Hanover; Adirondack chairs, Polywood Inc. in Syracuse, Indiana; teak dining set, Three Birds Casual LLC in Columbia City, Indiana (T). Kitchen: cabinetry design, Jan Swider of Cornerstone Home Remodeling Center in Bridgewater with maple cabinetry fabricated by Benchmark Cabinets in Fredericktown, Ohio (T); appliances, all KitchenAid except XO Ventilation range hood; granite countertop, All Granite and Marble Corp. in South Plainfield; backsplash, glass mosaics from Chester Tile & Marble Inc. in Morristown, seashore accent tiles from Mediterranean Tile & Marble in Bernardsville; cabinet hardware, Carpe Diem Hardware in Cranston, Rhode Island; lantern-style pendants, Hudson Valley Lighting through Capitol Lighting; window treatments (here and throughout), designed by Whitney Interiors and fabricated by Barbara Bonis of Custom Window Design in Lebanon with fabric by Clarence House (Bimini pattern); wall color, Silver Crest by Benjamin Moore. Breakfast Area: table, designed by Whitney Interiors and constructed by Wagoner’s Woodworking in Chambersburg, Pennsylvania; chairs, custom by Pebblehill Designs in Atlanta (T) with indoor/outdoor fabric by Kravet; chandelier, Low Country Originals in Bluffton, South Carolina; tableware, Home Goods and Pottery Barn with linens from Saro Trading Co. in Burbank, California (T). Living Room: sofas, Lee Industries Inc. in Conover, North Carolina, with indoor/outdoor Kravet fabric; coffee table, Saro Trading; console table, Vanguard Furniture Co. in Conover, North Carolina; Octopus print, Wendover Art Group in Largo, Florida. Sitting/Television Room: sectional, Kincaid Furniture Co. Inc. with Sunbrella fabric through Flemington Department Store in Flemington; ottoman, custom by Duralee with indoor/outdoor Duralee fabric; green mirror, Guildmaster (T) in Springfield, Missouri; woven blinds, Hunter Douglas; wall paint, Silver Cloud by Benjamin Moore. Master Bedroom: headboard, Bernhardt in Lenoir, North Carolina; Capri chandelier, Currey & Co. in Atlanta; white grass-cloth-covered Bungalow 5 dresser and Chippendale chairs, Housing Works in New York City; white bedside tables, bedding, silver garden stool, sea turtle wall art and shower curtains used to fabricate custom window treatments, Home Goods; area rug, Natural Area Rugs, naturalarearugs.com; wall color, Quiet Moments by Benjamin Moore. Daughter’s Bedroom: headboard, David Francis Furniture in Vero Beach Florida; bedding, Lilly Pulitzer; window treatments, Lee Jofa “Happy Plaid” and Robert Allen trim; wicker chair, Housing Works; chandelier, Ballard Designs with Shades of Light shades; wall color, Serenity by Benjamin Moore; lamps, rug and wall hangings, HomeGoods. Guest Room: bunk beds, Flemington Depart­ment Store; console table, Bungalow 5 through Housing Works; bench, Guildmaster; custom window treatment, vintage Lilly Pulitzer fabric and Samuel and Sons trim; chandelier, Shades of Light; area rug, Natural Area Rugs; wall color, Celadon Green by Benjamin Moore. Guest Bathroom with Fish Tile: vanity, designed by Whitney Interiors and fabricated by Benchmark Cabinets; floor and field tile, Garden State Tile in Wall Township; fish and wave tile accents, Chester Tile & Marble Inc.; polished quartz countertop, ACD Custom Granite; sconces, Murray-Feiss through Capitol Lighting; vanity hardware, Carpe Diem Hardware; mirror and assorted accessories, HomeGoods; wall color, Ebbtide by Sherwin-Williams. Guest Bathroom: aqua vanity, designed by Whitney Interiors and fabricated by Benchmark Cabinets; polished quartz countertop, ACD Custom Granite in Ocean; tile, Garden State Tile; cabinet hardware, The Home Depot; wall color, Celadon Green by Benjamin Moore; monogrammed towels, The Beach Home in Lavallette. Hallway wall accents: vintage sailor top, purchased at VNA rummage sale in Far Hills, custom framed by L&M Art Gallery in Elizabeth; horseshoe crab, homeowner find. T=To the Trade.